Australia is a parliamentary democracy. The Australian Constitution of 1901 established a federal system of government in Australia. Under this system, powers are distributed between a national government (the Commonwealth) and the six States. The Constitution defines the boundaries of law-making powers between the Commonwealth and the States/Territories. As well as the six States (New South Wales, Queensland, South Australia, Tasmania, Victoria and Western Australia) there are three self -governing territories - Australian Capital Territory, Northern Territory, and Norfolk Island. Legislation - the legal rules made by parliament and by those to whom parliament has delegated authority. A linked website, Campus, is an easy way for both students to keep abreast of the latest developments in the law – and share information and ideas. This 10 minute video by the Legal Information Access Centre explains how Parliaments make law, explaining the process of converting a Bill to an Act, how legislation changes over time, why the Commonwealth makes some laws and the States others, and delegated legislation such as regulations. 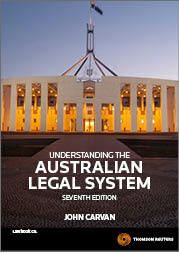 This 10 minute video by the Legal Information Access Centre explains how the Court hierachy,the jurisdiction of courts and tribunals, and how courts can make new law by interpreting legislation, filling gaps in legislation, and developing the common law when there is no legislation. A broad overview of the House of Representative with links to further information. Each fact sheet explains an element of the Australian system of government. A short documentary on the High Court of Australia.